Looks good in the bathroom. Easy to clean. I bought this as a gift for my brother. He uses it in front of his kitchen sink. He really likes it and says it doesn't move at all - it stays where you place it on the floor. It really makes my apartment look nice. The old carpet under neath is awful but this really made the dinning room look great I will be doing other rooms also. But us must train your cat I gave mine an old chair and she leaves my new carpet alone. I like the looks and utility of the floor mat, but I can't get the black rubber deposits from the reverse side off my wood floor. Ibought this to put under my office chair so my hardwood floor would not be marred by the wheels. Unfortunately, the wheels left marks on the bamboo...lots and lots of marks. So there is nothing wrong with the product. It is very attractive. It just did not work for me. I purchased these and received them swiftly. Packing was well done. Product looks as shown, except the bamboo is very thin, and the backing is just a thin covering. THESE SAY NON SLIP BACKING, BUT THEY ARE NOT!!! Years ago, I purchased some just like these, and they had a nice padded backing. These DO NOT. I was very disappointed in the quality of these mats. If I had known they did not have the padding, I would not have purchased these. Times have changed, quality suffers, I miss the old days. I'm finding quality issues in so many things and most people's reviews say "I just kept them, it was not worth the hassle to return"....I agree. I will keep them, but they were not what I wanted. And for the record, the one's I purchased years ago were the exact same price, and same size! They look nice, just not the quality they should be. You'll add to your expense to purchase a non-skid mat for under them, or they will walk all over your room. non-slip and won't yellow floor. i am going to use in front of kitchen sink. Need something for the kitchen in front of the stove and sink. Always loved bamboo, so I am willing to try and see if it does its job. Liked this before when I had one last for a long time. Good buy for the bucks. move around. If this one works I will probably order more. I chose this to give to my brother. He saw it in the catalog and thought he could use it in front of his kitchen sink. Just wanted from garage to bedroom. Looks like their thin enough to not get tripped on. Sounds like it will worl nicely in my kitchen in front of my sink. Non-slip, neutral color, easy to coordinate with decor. Stain resistant for busy stove and sink areas in kitchen. Needed something like this for kitchen and bath! I have been looking for these for a while. I had them before! 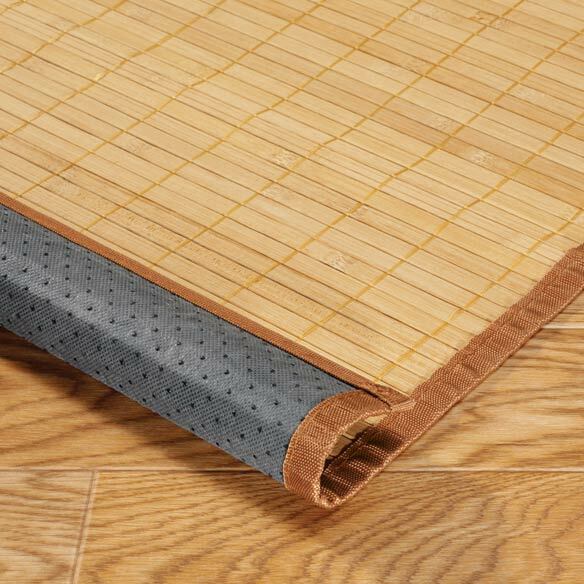 Bamboo mats are great and easy to clean. 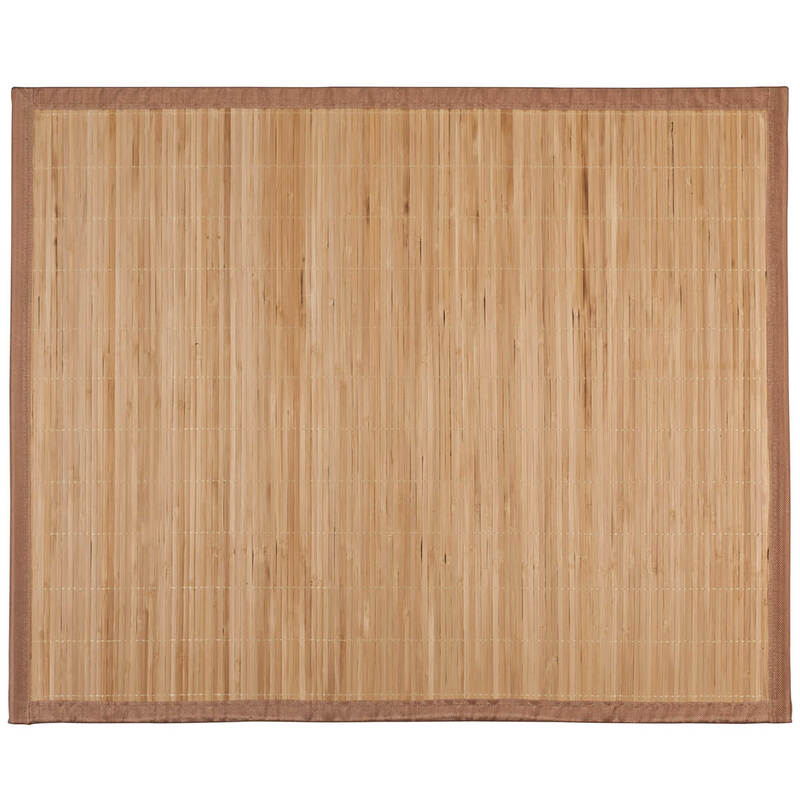 I wanted a bamboo kitchen mat and this one fit the bill in size style and price. BEST ANSWER: The mats aren't very thick. I use it in front of the cat's litter pans. I thought it would be longer from the picture, but I guess I could have looked at the size. Thank you for your question. The mats are 1/8" thick. We hope this information will be of help to you. They are a little thicker than and quite a bit sturdier than the roller shades you see for windows. One eighth of an inch at the binding, probably less overall. The mat is one-quarter inch thick. Will the bamboo rug harm the hardwood floors? Thank you for your question. This will not scratch floors. We hope this information will be of help to you. I used it on my tile floors. BEST ANSWER: I actually haven't had to wash mine which I have by the sink in the kitchen, and I've had it for over a year. I think I would just wash it by hand, not in a machine. It's bamboo so I would just put it in the sun to dry. I clean (wash them) with a small amout of dishwashing and bleach, using a mop pad. Rinse it off with a water hose or in the tub. BEST ANSWER: Thank you for your question. 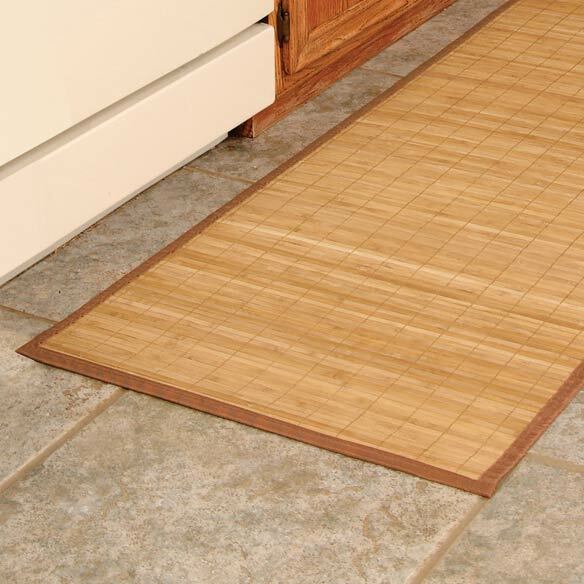 The Natural Bamboo Island Mat only comes in the light oak like color as shown in the photo. We hope this information will be of help to you. It's medium to light brown; it looks like natural bamboo.